Click on underlined text for more information and links. C. Grimaldis Gallery, Baltimore, MD. TAI Modern, Santa Fe, NM. C. Grimaldis Gallery, John Ruppert; Terra Firma, Baltimore, MD, 2017. The Academy Art Museum, John Ruppert: Grounded, Easton, MD, 2015. C. Grimaldis Gallery, John Ruppert: The Iceland Project, Baltimore, MD, 2013. Kohl Gallery, John Ruppert: Sandbox Visiting Artist Exhibition, Washington College, Chestertown, MD, 2013. C. Grimaldis Gallery, Baltimore, MD, John Ruppert: The Nature of Things, 2011. C. Grimaldis Gallery, Baltimore, MD,2007, 2002 & 2000. John Davis Gallery, Hudson, NY, 2007 & 2001. John Davis Gallery, New York City, 2005. Weatherspoon Gallery, Greensboro, NC, 2002. Montalvo Art Center, Saratoga, CA, 2002. Evanston Art Center, Evanston, IL, John Ruppert-Sculpture on the Grounds, 1999. Harmony Hall Regional Center, Fort Washington, MD, Opulence -The Cast Sculpture of John Ruppert, (catalogue) curator-Adam J. Lerner, 1998. 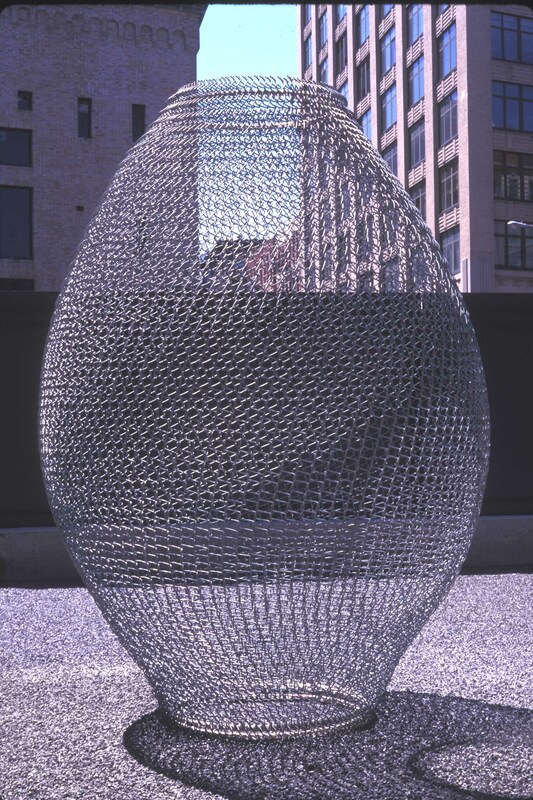 Art et Industrie, New York City, John Ruppert: Installation in the Garden, 1997. Chicago Cultural Center, Natural Forces/Urban Context: John Ruppert a 15 year survey, (catalogue) curator-Gregory Knight, a traveling exhibition of Ruppert’s sculptures and drawings, organized and exhibited at the Chicago Cultural Center 1996-1997, other venues included: The Contemporary Art Center of Virginia, VA, Cleveland Center for Contemporary Art, OH. Arnold and Porter Law Firm, Washington, D C, Emerging Forms, curator - Sarah Tanguy, Exhibition Director, International Sculpture Center, 1989. Barbara Fendrick Gallery, New York City, Sculpture & Drawing, 1989. Southeastern Center for Contemporary Art, Out Door Sculpture, Winston/Salem, NC, 1988. American Red Cross, Regional Office, Sculpture, St. Louis, MO, 1988. George Ciscle Gallery, Baltimore, MD, Sculpture & Drawings, 1987 & 1985. Foggy Bottom Outdoor Sculpture Biennial, Watergate, Washington, DC, 2018. Kreeger Museum, 20th Anniversary Celebration Exhibition, Washington, DC, 2014-15. “Urban Garden”, The Rose Kennedy Greenway, Boston, MA, Curated by Nick Capasso, DeCordova, Museum & Sculpture Park, Lincoln, MA, 2011. Miami, FL, Miami Sculpture Biennale, (in conjunction with Art Basel Miami), curator-Ricardo Pau-Llosa, 2010. World Expo 2010, Shanghai, China, Riverside Landscaping Project, 2010. James Madison University, Harrisonburg, VA. 2010-2012. Bridge Gardens, Bridge Hampton, NY, 2010. Baltimore Museum of Art, Baltimore, MD, Baker Artist Award Exhibition, 2009. Miami University, Oxford, Ohio, Bicentennial Exhibition, 2009. Gallery 405, Baltimore, MD. Grimaldis @ 405, 2008.
International Artist and Arts, Material Terrain, (catalogue) traveling exhibition commissioned by Laumeier International Sculpture Park, St. Louis MO, 2005-2007, venues included:Laumeier, St. Louis, MO,Santa Cruz Museum of Art, CA, University of Arizona, AZ, Memphis Brooks, TN, Columbus Museum of Art, GA, Cheekwood, Nashville, TN, Lowe Art Museum, Miami, FL, Museum at Grounds for Sculpture, Trenton, New Jersey, Enclosures, 2007. OMI International Sculpture Park, New York, Hay Stacks, 2004-2010. The Contemporary Museum of Art of Estonia (KUMU), Tallinn, Estonia, ShiftScale, (catalogue) 2006. Chesterwood Sculpture Park, Stockbridge, Massachusetts, 2006. Pedvale International Open Air Museum, Latvia, 2006-2009. Herron Gallery of Art, Indianapolis, IN, Biennial Exhibition, 2005. Pirkkala Sculpture Park, Pirkkala, Finland, 2003. Just the Thing, Contemporary Outdoor Sculpture and the Object, curator-Nick Capasso. DeCordova Museum and Sculpture Park, Boston, MA, 2000-2003. Leigh Yawkey Woodson Art Museum, Wausau, WI, 1998-2000. Kreeger Museum, Washington, DC. Representing the Present, (catalogue) curator-Jack Rasmussen, 2000. Contemporary Art Museum, Raleigh, NC, 99Days of Art, 2000-01. SECCA, Winston/Salem, North Carolina. 2000-01. Stone Quarry Hill, Cazenovia, New York, 1998-2000. Chicago Navy Pier, IL, Pier Walk, (in conjunction with Art Chicago), 1998, 1997 & 1996. Southeastern Center for Contemporary Art, Open Air Gallery, Winston/Salem, NC, Out Door Sculpture. 1988. Laumeier International Sculpture Park, St. Louis, MO, Artists on the Green, 1981. Foggy Bottom Outdoor Sculpture Biennial, Watergate, Washington, DC. 4/2018 -10/2018. C. Grimaldis Gallery, Within / Without, photography, Baltimore, MD, 2015. Los Angeles Center for Digital Art, International Competition for Digital Artan, 2014. Photography, Curators; Joanna Szupinska-Myers, Curator of Exhibitions, California Museum of Photography and Ryan Linkof, Parson Curatorial Fellow, LACMA, CA, 2014. C. Grimaldis Gallery, During FRIEZE, “Downtown Art Fair”, Armory, NYC.-2014. Carla Massoni Art Gallery, “Timeless Rhythms : Sensing Change,” Chestertown, MD. 2014. C. Grimaldis Gallery, Dallas Art Fair, TX. 2014. Art Miami, Special Exhibition, “Think Big,” Miami, FL. 2013. VisArts, “This is Labor,” Curators Anne Reeves and Claire D’Alba, Rockville, MD, 2013. The Texas Contemporary Fine Art Fair, Houston, TX. 2013. Burchfield Penny Museum, Iron Organism, (Catalog,) Buffalo, NY, 2012. Chroma Project Art Laboratory, Centripetal and Centrifugal Forces, Charlottesville, VA, 2012. Houston Fine Art Fair, Houston, TX, 2012. Janet & Walter Sondheim Prize Semi-finalist Exhibition, Maryland Institute College of Art, Baltimore, MD 2012. Art Museum of the Americas, Washington, DC, Corridor, (Catalogue) 2011. Katonah Museum of Art, Katonah, NY, Mapping: Memory and Motion, curator-Sarah Tanguy, 2010. The Contemporary Museum, Baltimore, MD, FAX’s, in conjunction with the Drawing Center, NYC, curator-Irene Hofmann, 2009, Benefit Auction Exhibition, 2001, Snapshot, traveling exhibition, 1999. China, Traveling exhibition sponsored by AutoDesk, e-Forms, (catalogue) 2008-09 Artmap Gallery, Wenzhou, Jinse Gallery, Chongqing, Shanghai Duolun Museum of Modern Art, Shanghai, Beijing Today Art Museum, Beijing. Eight Modern, Santa Fe, NM, Sculpture Exhibition, 2007. American University, Katzen Museum, DC, Inaugural Exhibition, curator-Jack Rasmussen, 2005. US State Department, Washington, DC, 40th Anniversary Art In Embassies Exhibition, 2004. Klein Art Works, Chicago, IL, John Ruppert / Rebecca Shore, 2003. Grounds for Sculpture, Trenton NJ, 2300°F-2002, Iron in the 21st Century, 2202. Muzeum Okregowe Leona Wyczolkowskiego W, Bydgoszczy, Poland, Mixing realities, (catalogue) 2001. Korean Embassy, Washington, DC, East Meets West, 2000. McLean Project for the Arts, Hyper Salon, prints and multiples, curator-Andrea Pollan, McLean, VA.1999. Grounds for Sculpture, Trenton, NJ, Cast In Iron, curator-Mimi Weinberg, 1998. Art Museum of Western Virginia, Roanoke, VA, Gravity / Levity, curator -Mark Scala, 1998. Goya-Girl Press, Baltimore, MD, Prints and Sculptors, 1998. Lithographic Academy, Tidaholm, Sweden, International Lithography Symposium, 1998. Poland; Works on Paper, traveling exhibition, 1996-1997, Konin Regional Museum, Konin. Center of Culture Castle, Poznan, Zytardow District Museum, Zytardow, Poznad Museum Castle, Poznan. Maryland Institute, College of Art, Decker Gallery, Baltimore, MD, ArtScape: a 15 -Year Survey, 1996. Delaware Art Museum, Wilmington, DE, Biennial, 1996. Hotel du Department, Marseille, France. Luminy-Marseille, France; Triangle Workshop Exhibition, curator - Karen Wilkin.1995. Corcoran School of Art, Washington, DC, Sites 6; Biennial Exhibition, curator -Samuel Hoi, 1994. Maryland Art Place, Baltimore, MD; “Zero Defect,” A major two-person exhibition with painter Timothy App, curator-Jack Rasmussen, 1994.
International Sculpture Conference ’92, Philadelphia, PA “Maryland Sculptors on View,” in conjunction with the ‘92 Conference, 1992. Farnsworth Museum, Rockport, ME, Invitational, Ritual Journeys and Inner Voyages, (catalogue) 1990. Columbia Square, Washington, DC, in conjunction with the International Sculpture Conference, curator-Joshua Smith, 1990.
International Sculpture Center, Washington, DC, Invitational, curator - Sarah Tanguy, 1989. Traveling Exhibition, 1988, Center d’Art du Rouse-Cloite, Brussels, Belgium, IBM Education Center Art Gallery, Mainz, West Germany. Mitchell Museum, Mt. Vernon, IL, Invitational, curator - Charles Butler.1987. United Nations Traveling Exhibition, MO, Invitational, 1986. Osuna Gallery, Works On Display, Washington, DC, 1983. St. Louis Art Museum, St. Louis, MO, Visual Catalogue II, 1982. Hudson River Museum, Yonkers, NY, Invitational, Paper Works ’80, 1980. Marlborough Gallery, On Display, New York, NY, 1979. Kaohsiung Museum of Fine Arts, Kaohsiung, Taiwan, 1988. Katonah Museum of Art, John Ruppert out door exhibition, Katonah, NY, 5/2014 - 3/15. 2012 The West Lake Sculpture Park, Hangzhou, China. World Expo 2010, Shanghai, China. Grounds for Sculpture, Trenton, NJ. Skokie Northshore Sculpture Park, IL. U. S. Chancellery, Lapaz, Bolivia. Nanking College of Fine Arts, Nanking, China. Contemporary Art Foundation (Ecovar), Marseille, France. Joshua Tree Artist Residency, 2018. Hydra Artist Residency, Lipary, Italy, 2017. Maryland State Arts Council Individual Artist Award in Photography, 2015. Presenter & Participent; Chandigarh Lalit Kala Akademi International Art Conclave, India 2/2015. Artist In Residence, Andrew Mellon Foundation funded, Sand box Project, Selected to collaborate with scientists,artists in other disciplines, and the community at large to develop art works, Washington College, MD, 2013-14. Janet and Walter Sondheim Prize, Semi-Finalist, 2012. Djerrassi Resident Artist Program, Woodside , CA. 2012. SIM Artist-in-Residency, Reykjavik, Iceland, June 2012. Spring Semester Research Award, University of Maryland, College Park. 2012. Fall Semester Sabbatical Award, University of Maryland, College Park. 2011. The William G. Baker Jr. Memorial Award, $25,000, 2009. Maryland State Arts Council Individual Artist Award, 2009, 1997, 1995 & 1991. GRB University of Maryland Semester Research Grant 2008. U.S. Department of State Federal Assistance Award; Sponsored by the American Embassy, to represent the U.S. at the inaugural exhibition of the Museum of Contemporary Art KUMU in Tallinn, Estonia, 2006. Pedvale Open Air Art Museum outdoor Sculpture Symposium, Latvia 2006. Triangle Workshop, Marseille, France; an international retreat of 32 artists from around the world with visiting artists and critics, 1995. St. Louis/United Kingdom Artist Exchange Program. Selected as the St. Louis representative to travel, make sculptures, and give slide lectures to communities and five university sculpture departments in the United Kingdom, 1985. The Chicago Tribune, By Alan G. Artner, May 02, 1996. Sculpture magazine, John Ruppert, Staging Energy, pp 46 -51, Sarah Tanguy, September 2012. Art China, John Ruppert, May, 2009, Kat Xu. 2015 Central South Univerisity, Changsha, China. 2010 James Madison University, VA.
2009 Studio tour & Baker Exhibition Talk at The Baltimore Museum of Art: Hosted byMichael O’Sullivan, Critic and Jack Rasmussen, Director of the Katzen Gallery for the International Arts Journalism Institute, funded by the NEA. 2009 George Mason University, VA.
2008 Futang University, Shanghai, China. 2007 Central Academy of Fine Arts, Beijing, China. 2006 Art Academy of Latvia, Riga, Latvia. 2006 Estonia Academy of Fine Arts, Tallinn, Estonia. 2005 Katzen Gallery, American University, Washington, DC. 2004 Grounds for Sculpture, Trenton, NJ. 2003 University of Minnesota, Minneapolis, MN. 2003 National Gallery of Art, Washington, DC. 2002 Montalvo Art Center, San Jose, CA. 2002 Weatherspoon Gallery, Greensboro, NC. 2001 Kreeger Museum, Washington, DC. 2000 Visiting Artist – Docent Lecture, The Baltimore Museum of Art, Baltimore, MD. 1999 Evanston Art Center, Evanston, IL. 1998 International Iron Conference, Johnson Atelier, Trenton, NJ. 1998 Art Museum of Western Virginia, Roanoke, VA.
1997 Visiting artist & critic - W. Virginia University, Morgantown, WV. 1997 Visiting artist & critic - Maryland Institute, College of Art, Baltimore, MD. 1997 Towson State University, Towson, MD. 1996 Chicago Cultural Center, Chicago, IL. 1996 Virginia Beach Contemporary Art Center, Virginia Beach, VA.
1996 Cleveland Center for Contemporary Art, Cleveland, OH. 1996 The Cleveland Institute of Art, Cleveland, OH. 1996 Art Department ,Youngstown State University, Youngstown, OH. 1996 Maryland Institute College of Art, Baltimore, MD. 1995 Baltimore Museum of Art/Sculptors Incorporated, Baltimore, MD. 1994 Visiting Artist - Art Department, University of Iowa, Iowa, City, IA. 1993 Visiting Artist- Art Department, Webster University, St. Louis, MO. 1992 Sculpture Conference ’92, Philadelphia, PA.
1992 Visiting Artist- Alfred University, Alfred, NY. Two days of criticism, casting demonstration, slide lecture. 1990 Visiting Artist- “Foundry Workshop,” Johnson Atelier Fine Arts Foundry, Trenton, NJ. 1991 School of Architecture, University of Maryland, College Park, MD. 1988 American Red Cross, Regional Office, St. Louis, MO. 1987 Center for Contemporary Art, St. Louis, MO. 1985 West Surrey School of Art and Design, Farnham, United Kingdom. 1985 Scarborough International Arts Festival, Scarborough, United Kingdom. 1985 Sunderland Polytechnic, Sunderland, United Kingdom. 1985 Newcastle Polytechnic, New Castle Upon Tyne, United Kingdom. 1985 Leicester Polytechnic, Leicester, United Kingdom. 1985 Loughborough School of Art and Design, Loughborough, United Kingdom. 1977 MFA, Rochester Institute of Technology (RIT), School for the American Craftsman, Rochester, NY. 1974 BA, Fine Arts & Art Education, Miami University, Oxford, OH. 2001 - Present Full Professor, University of Maryland, College Park, MD. Sculpture, Drawing, and 3D Design. 1998-2011 Chair, Department of Art, University of Maryland College Park, College Park, MD. 1993-2001 Associate Professor, University of Maryland, College Park, MD. Sculpture, Drawing, and 3D Design. 1987-1992 Assistant Professor, University of Maryland, College Park, MD. Sculpture, Drawing, and 3D Design. 1980-1985 Instructor- Full-time, Webster University, St. Louis, MO. Sculpture, Drawing, 2D/3D Design, and Management in the Arts. 1979 Visiting Instructor; University of Wyoming, Laramie, WY. Undergraduate and graduate level sculpture and drawing, summer. 2016 Presenter; International Sculpture Conference, Pittsburg, PA.
2012 Presenter; Nor easter Cast Iron Art Conference, Buffalo, NY. 2004 Presenter; Snow Shoe Institute, WV, Exhibited sculpture and conducted discussions on sculpture. 2003 Juror; Art Scape: Outdoor Sculpture, Baltimore, MD. 2003 Visiting Artist; University of Minnesota, One week visit, critiquing Graduate students work, giving demonstrations and making art work. 2000 Panelist; Remembering the Present, Kreeger Museum, Washington, DC. 1999 Juror; Designs for the new Dollar Coin, Department of the Treasury, United States Mint, Washington, DC. 1998 Selection Panelist; Government Services Administration, Sculpture Commission for the new Food and Drug Administration Building, College Park, MD. 1989 Juror; Prince George Community College Undergraduate Art Exhibition, MD. 1985-87 Resident Artist; Liberty Foundry, St. Louis, MO. Access to entire facility for research and development ond my sculpture. 1986 Resident Sculptor; River Faces Production Workshop, St. Louis, MO. 1977-79Sculptor in Residence; Wildcliff Museum, New Rochelle, NY. Pursuit of personal artistic development, design and construction of studio-forge. Teaching: College of New Rochelle internship programs, apprentice-ship programs, and instruction of students. 1976 Studio Assistant- to Albert Paley (Internationally recognized Sculptor/Craftsman), Rochester, NY. Fabrication of major architectural iron works.